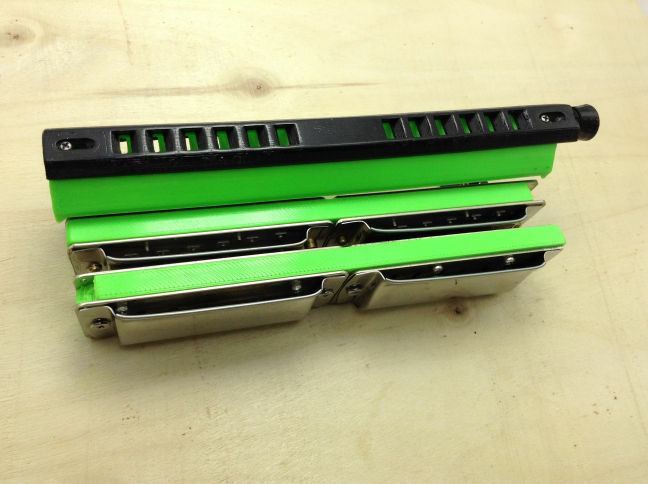 TWIN-DIATONIC HARPS - A World of New Possibilities! 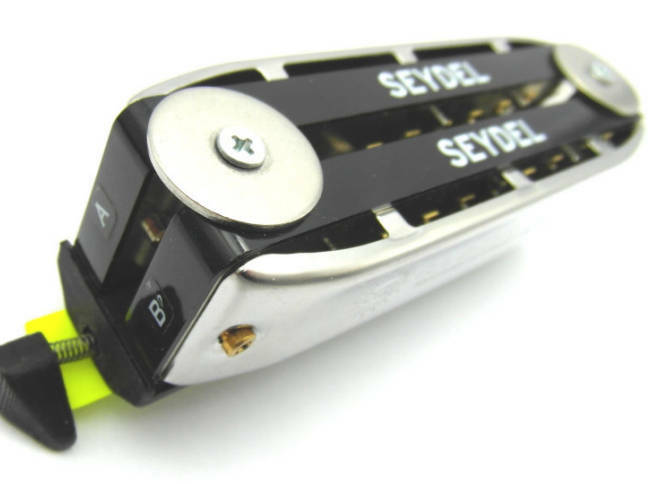 The idea of combining two 10-hole harps behind a single mouthpiece is not new - but it's not easy to get good reed response, and has never been done convincingly before. That's all changed! After intensive R&D over the past couple of years, I've come up with a quick-change assembly that really works. I'm now releasing my ground-breaking Twin-Diatonic harps in a range of exciting options - check out the two videos to see and hear them all in action. The OctaHarp, TremoloHarp, and OctaHarp Selectable give 10-hole players access to rich double-reed sounds in the size and hole spacing they're used to, for the first time! The OctaHarp and TremoloHarp have two harps stacked behind a single mouthpiece unit, and enable you to swap in different keys quickly with a few turns on the retaining screws. The patent pending OctaHarp Selectable is two harps inline an octave apart, which can be moved laterally against each other. 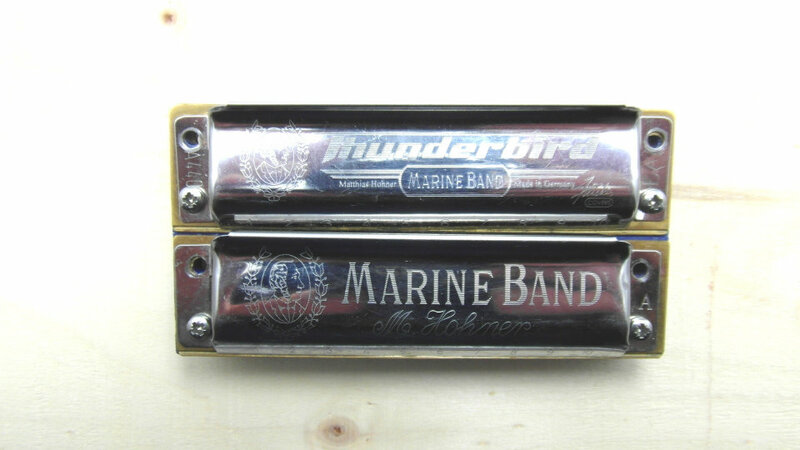 They can be played together for a full octave sound, or just the front harp can be selected with a simple thumb movement- allowing typical single-reed playing with bends. 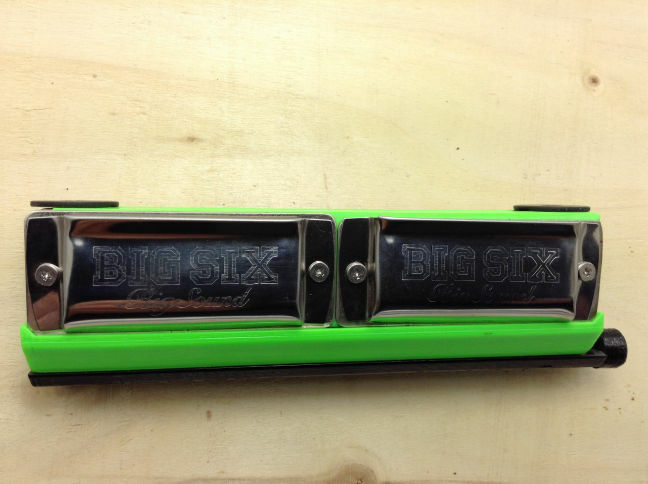 A quick thumb movement puts them back into octave mode again. 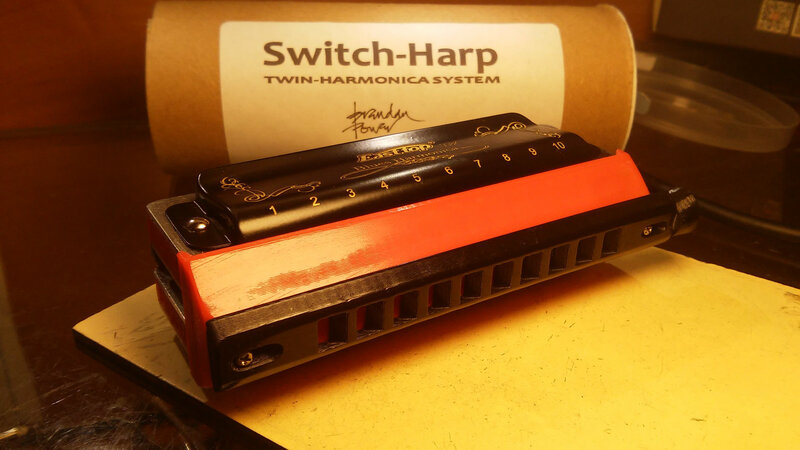 My Switch-Harp uses the same format to achieve two new and exciting possibilities. 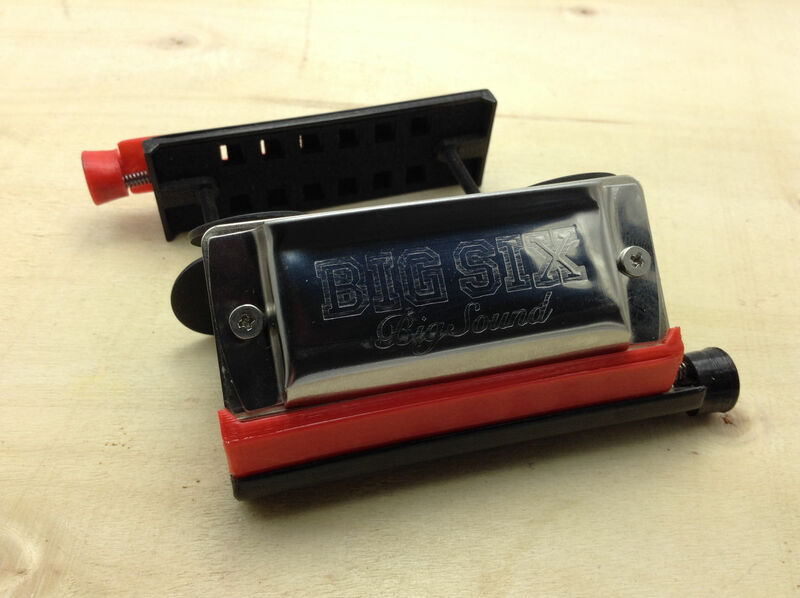 A patent-pending self sealing slider mouthpiece switches your breath to each of the harps in turn. If they are tuned a semitonbe apart (eg. 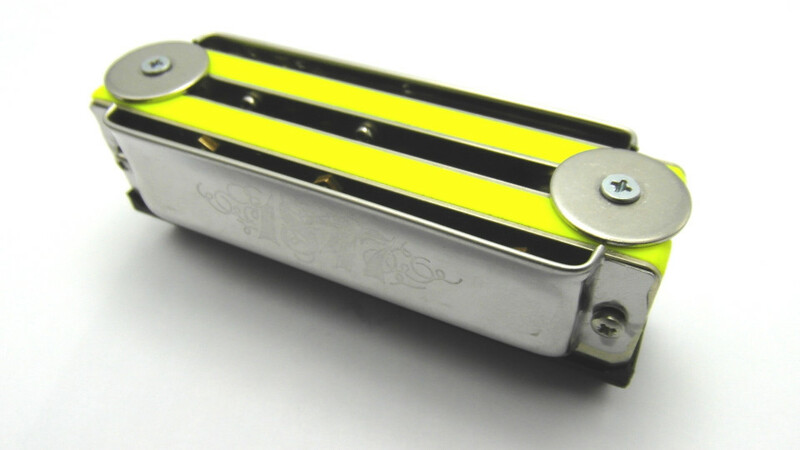 C and Db harps), you have a mini chromatic: a real chromatic blues harp, with all the bending and soul you're used to, PLUS the chromatic notes built in! This makes playing jazz and other advanced forms of music much easier on the 10-hole harp: just move the slider and you have all those notes that were only attainable with overblows in the past. 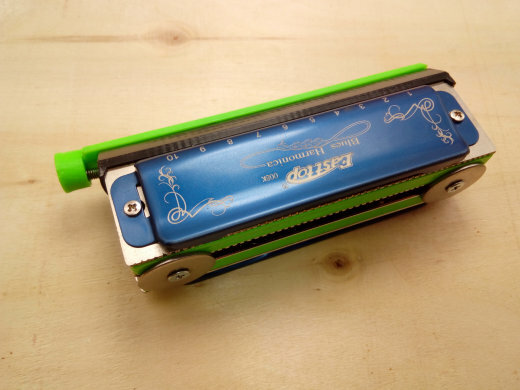 And possibly, with expert overblow setup and no valves, it could be possible to have the slider notes PLUS overblows on two harps at your disposal. But in half-valved setup it works great -as you can hear on the Part 2 video. 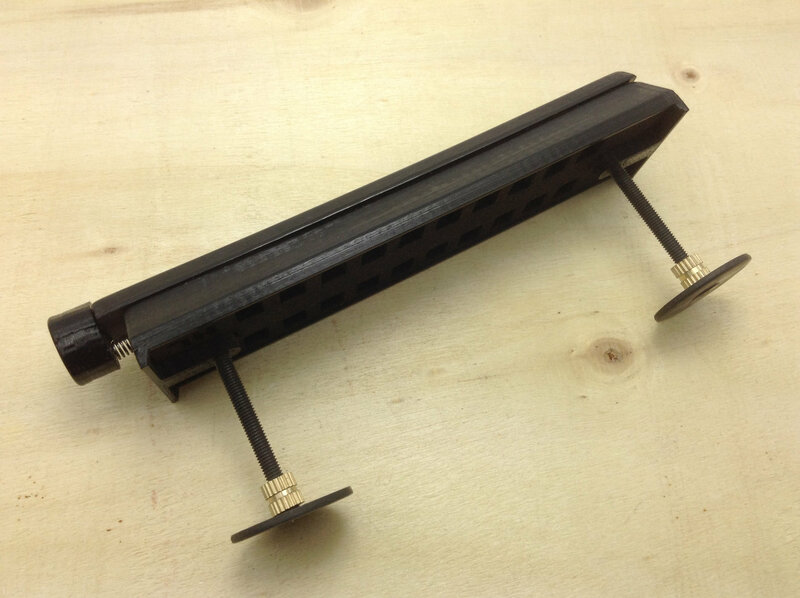 It doesn't stop there: the same front unit with slider could be used to house two harps in widely different keys, or even different tunings! Just move the slide and suddenly you're playing a completely different harp, without taking your lips off the instrument. This has a lot of cool possibilities... If this is your main use, you could remove the spring so the slider stays in place at either of the two positions. 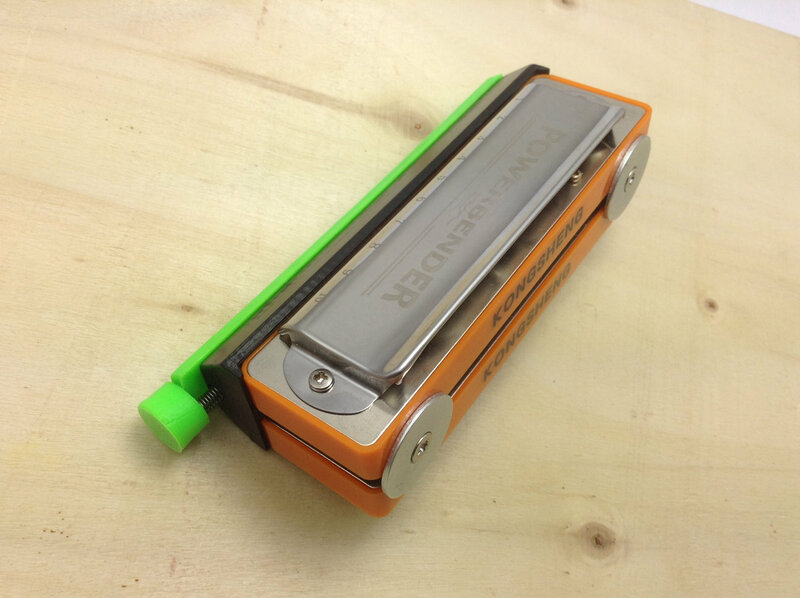 The X-Reed UniBender uses a patent-pending front valve strip to isolate two attached harps according to your breath. Blow, and the air only goes to the top harp; draw, and only the bottom harp sounds. 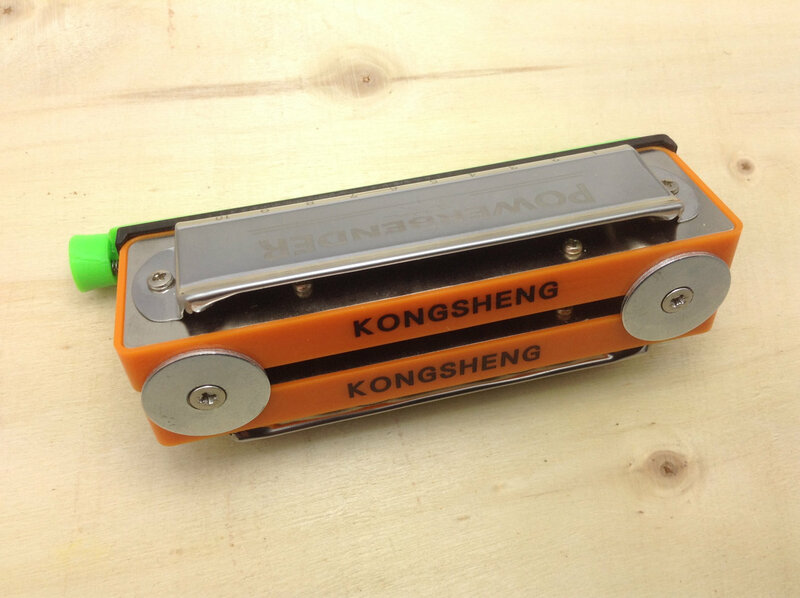 This gives several interesting new harmonica options, with the advantage of no valves on the reedplates (eg. 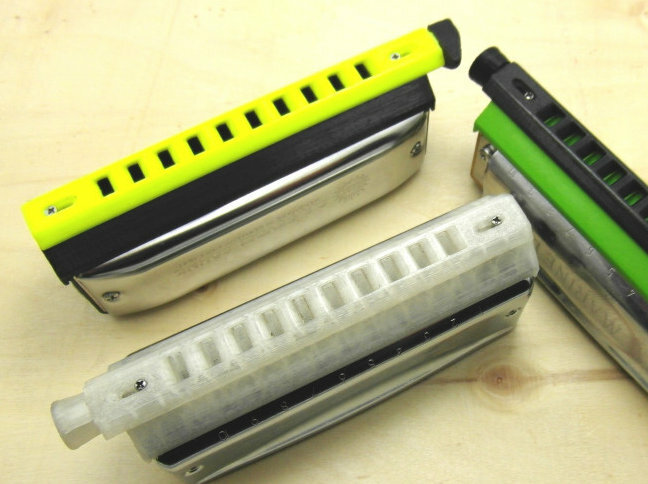 other types of octave and tremolo harps). 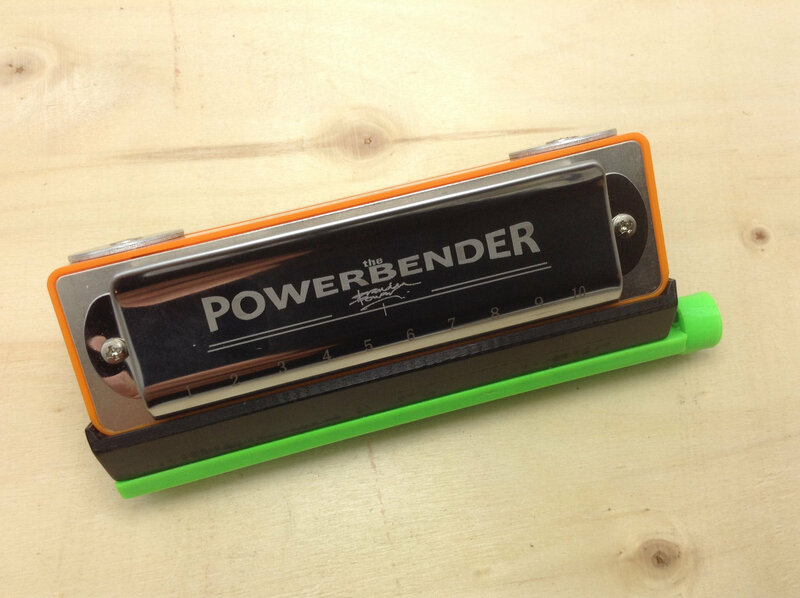 But the one I show in the video is an all-bending x-reed type. 20 of its reeds make the main notes, and the other 20 are x-reeds which allow them ALL to bend - as much as you want! An obvious choice is to make 8 of the bends the same as on stock harps (which only has 8 bendable notes), and the rest to go down a semitone. This gives a fully chromatic harp with bends alone, plus lots of cool 'bend enharmonics': notes you can get two ways, bending or non-bending. 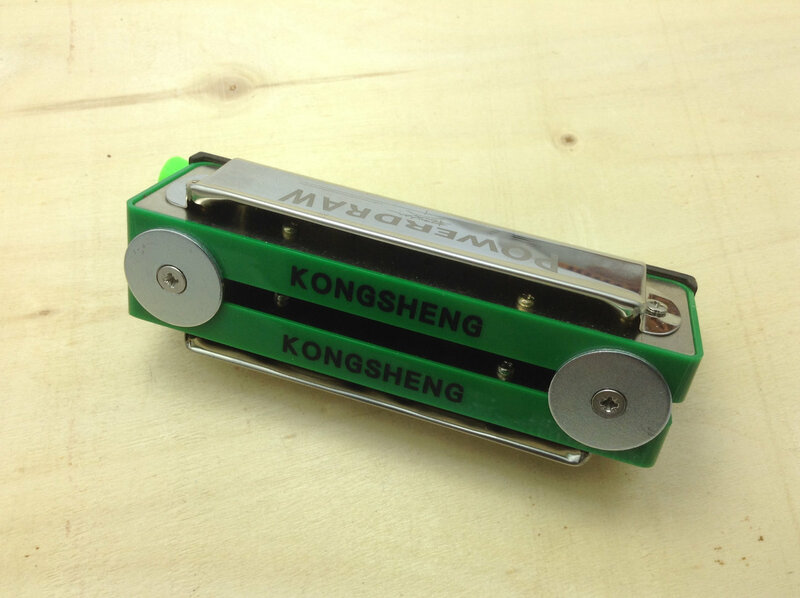 Another way is to tune the x-reed so the bends go down to the next note of the home scale, whatever that is. It's very expressive - I demonstrate a Solo tuned version in the video. My Twin-Diatonic harps will play valveless as long as you have close reed gapping and expert embossing, but most definitely benefit from either half or full valving. 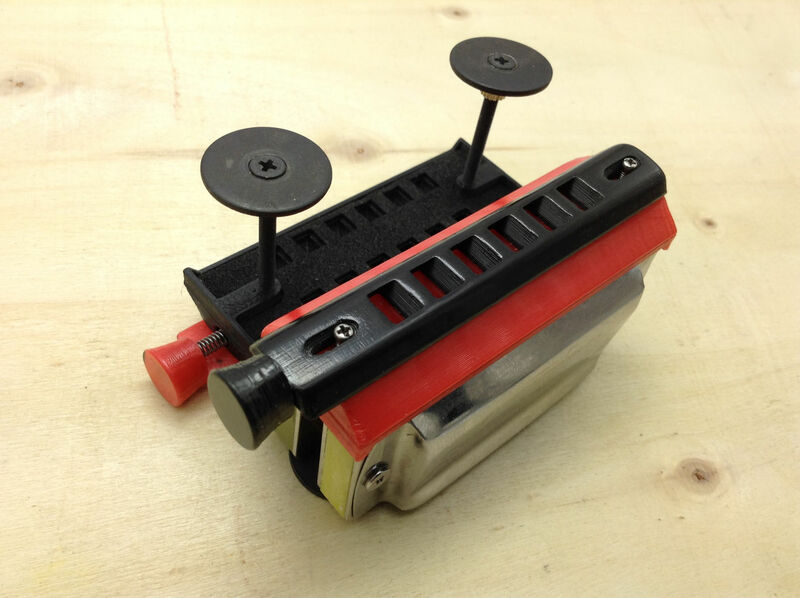 Most harp players are leery of valves, associating installing/using them with hassle and problems - but it doesn't have to be that way! 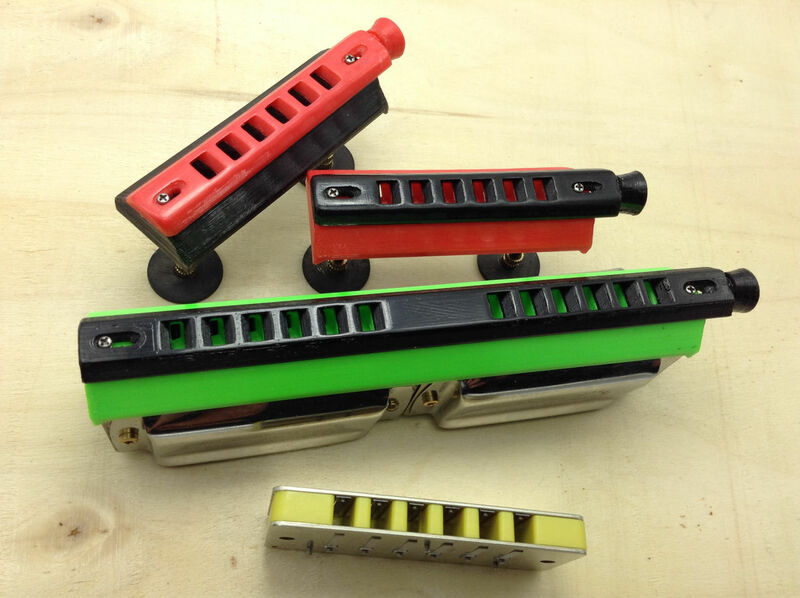 After much testing, I've developed my own line of Stealth-Valves for all brands and sizes of diatonic harmonica. Laminated valves with a soft under-surface for low noise, they lie flat and work reliably - you won't even know they're there! I've come up with an easy way to install them as well, something anyone can do. Video and options here. 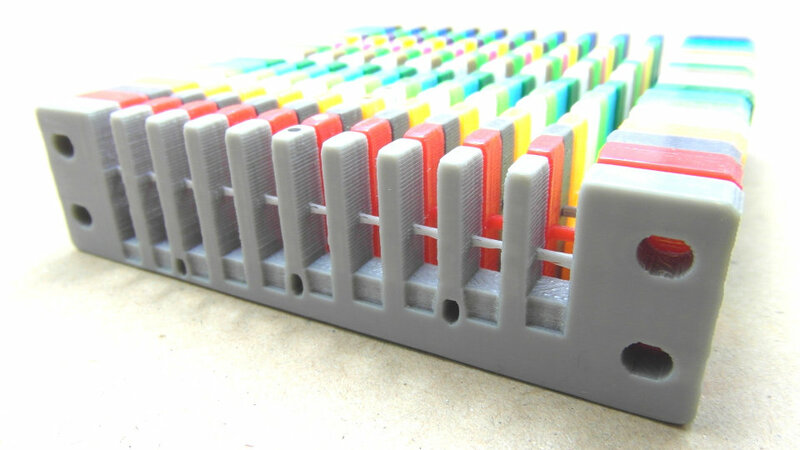 Most commercial and custom 10-hole combs don't have adequate room for fitting valves. To ensure my Stealth Valves fit without hassle, I've developed a range of Diatonic PowerCombs with special valve pockets on the underside of the comb, to take the bases of the valves. 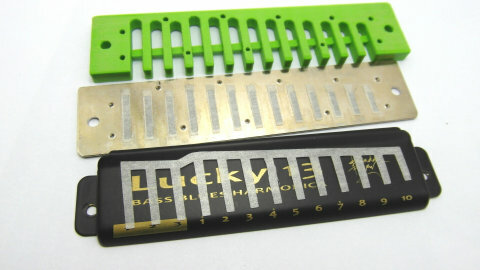 My PowerCombs have several other great features too, and can be bought for normal single-harp use. Using my combs and valves with the TwinDiatonics will ensure they work to their best. 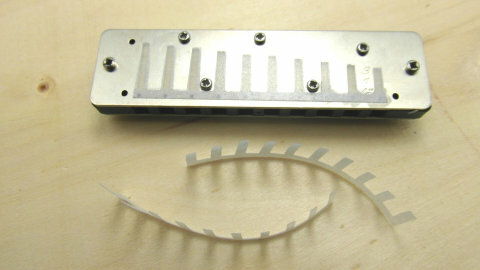 Good reed gapping and slot embossing will always help too, though valving makes these aspects less important than they are on un-valved harps. 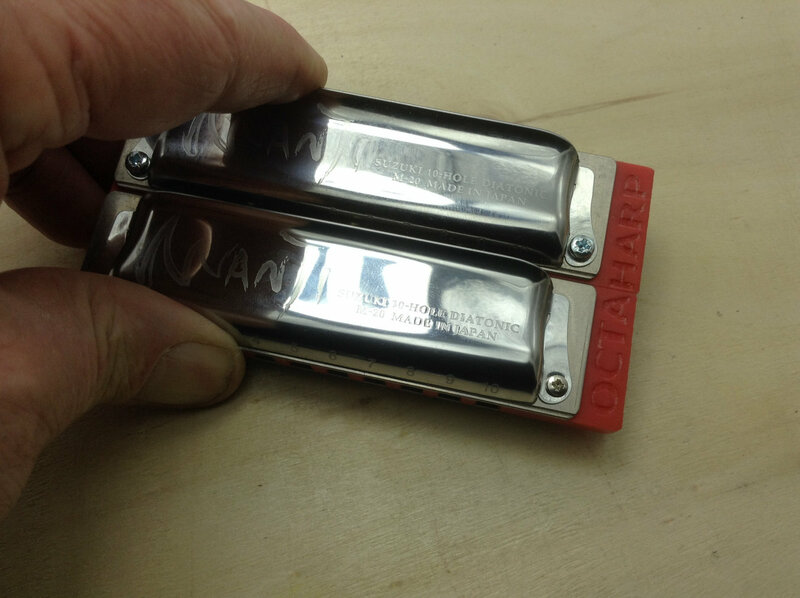 I've created two types of small 10-hole octave harmonica: the OctaHarp and the OctaHarp Selectable. Both of them combine two diatonic harps an octave apart to make one compact instrument with the big double-reed octave sound. It's a very satisfying tonality that suits many kinds of music - Cajun and Irish would be two that spring to mind, but octave playing can suit any style you can think of! 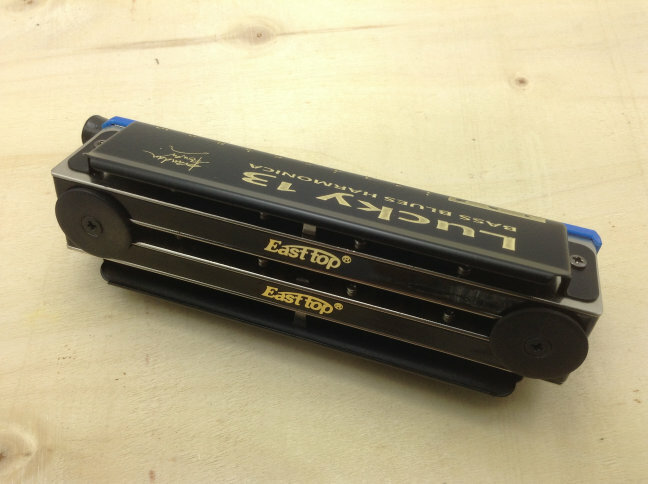 My OctaHarp stacks two 10-hole harps one above the other behind a single mouthpiece, one harp in the standard range and the other in the same key one octave lower, allowing you to play both simultaneously. 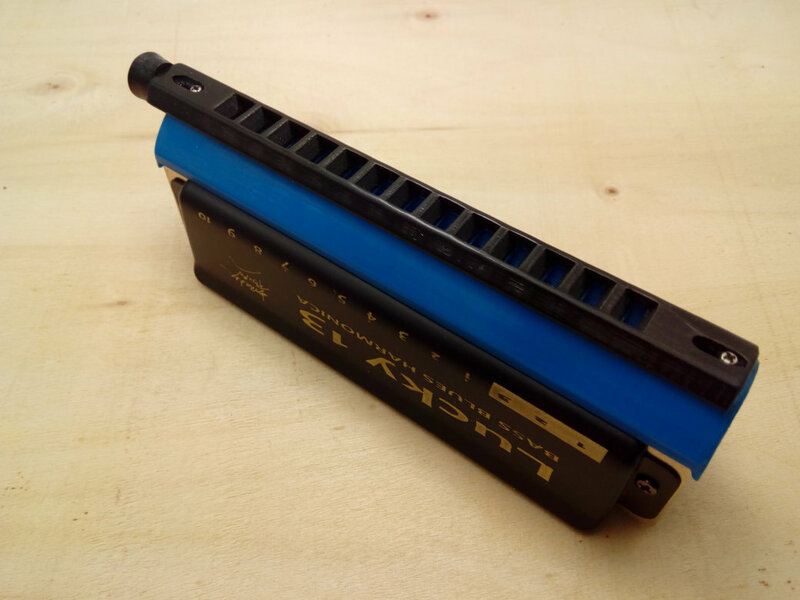 At this stage three manufacturers make low-range harps, Hohner, Suzuki and Seydel, and I've designed a version of the OctaHarp to fit each brand. Because there are double the number of reeds in the airstream at all times, to avoid excessive air loss and get the best sound, full valving is pretty much essential for the OctaHarp. Without valves the instrument will work but sound quite airy; with valves it will sound crisp and loud. 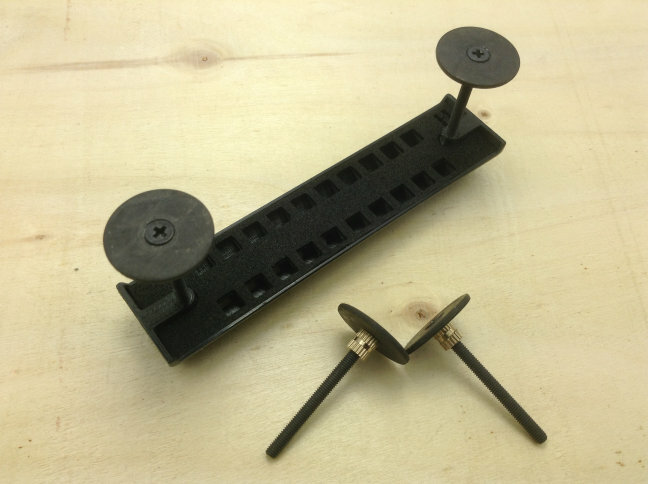 In order to facilitate adding valves to various brands and sizes of diatonic harps, I've created my valve friendly PowerCombs and easy-fit Stealth-Valves . These have special 'valve pockets' at the rear of each chamber, so the valve bases don't get snagged between the comb and reedplates. 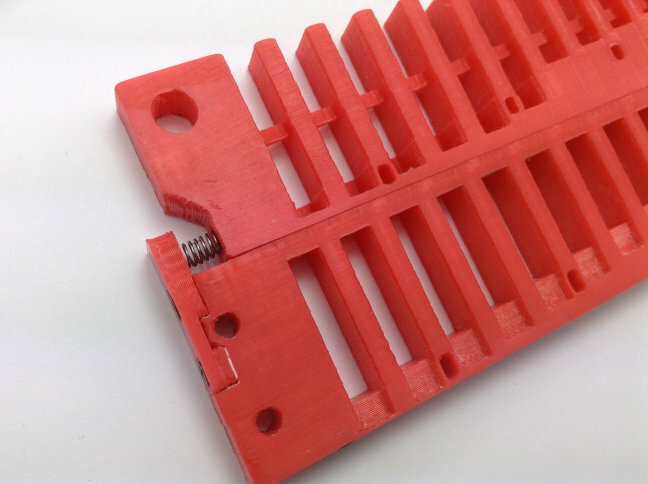 While you can just buy the front unit to assemble your own OctaHarp using stock combs, trying to fit single valves to combs not designed for them can be tricky and frustrating. Adding my specially-designed PowerCombs and Stealth-Valves to your order will simplify and speed up the process of making an OctaHarp that sounds great straight away. They are available at half-price when ordered for the TwinDiatonic harps. 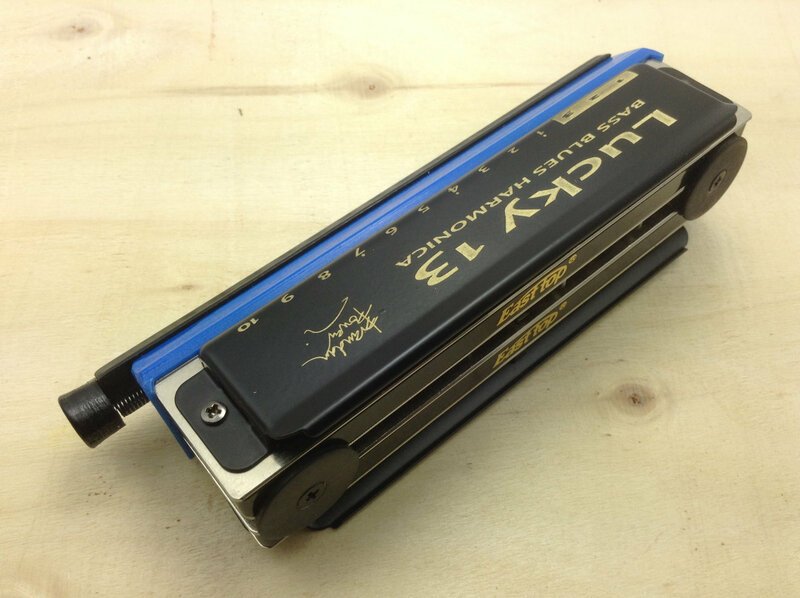 Joel Andersson is a great player as well as the Hohner Recommended Customiser for the OctaHarp and my other TwinDiatonics. 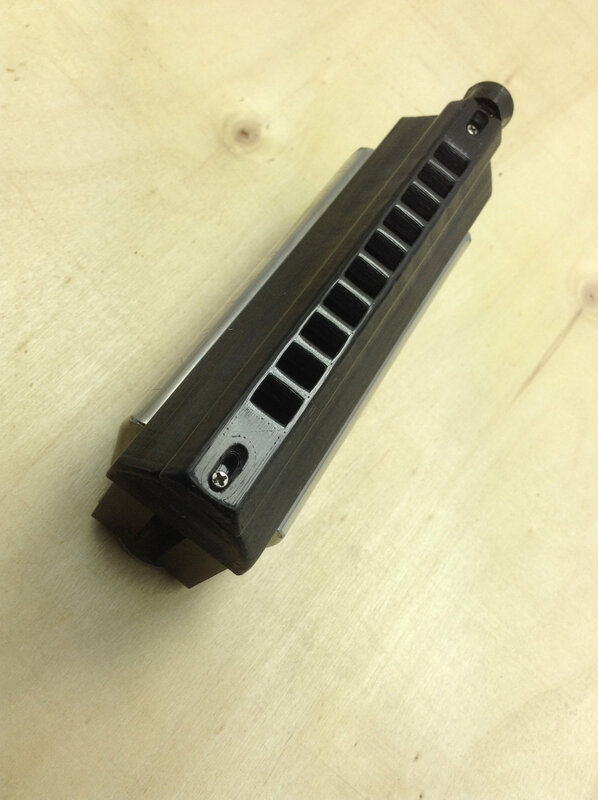 If you want an Octaharp that sounds like this, Joel will make it for you! The one essential part you require is the Front Unit. 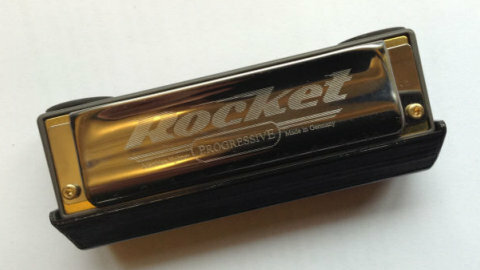 However, where appropriate, we recommend you also purchase PowerCombs and Stealth-Valves. They are specially designed to suit the TwinDiatonic harps; we can't guarantee all other combs will fit perfectly, and combs without valve pockets will definitely cause more hassle to install valves. (Lipped-comb versions will use the stock comb). 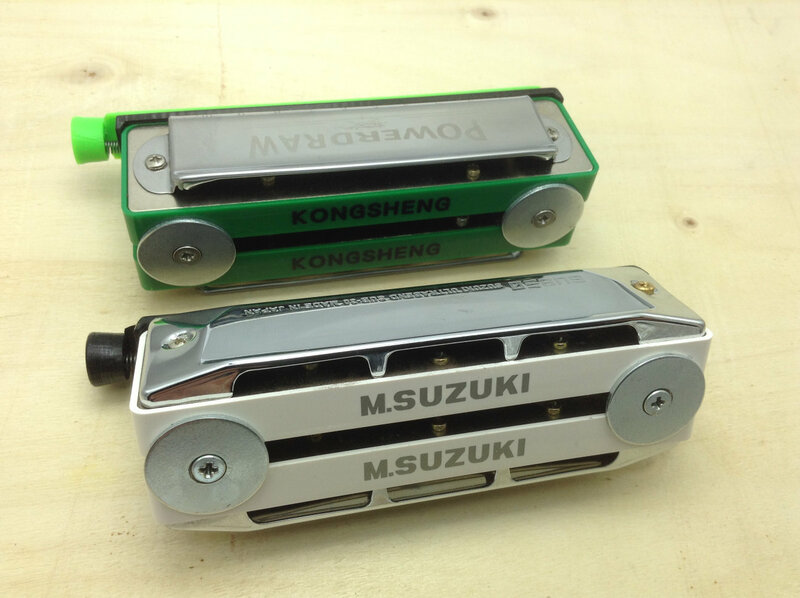 You need to supply the harmonicas, or order them from your customiser. Please watch all the relevant videos above to help you make an informed choice of ordering option. 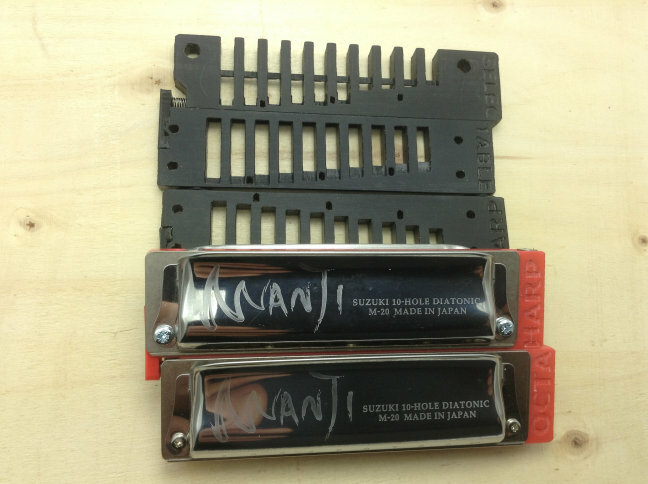 To slash the price and offer immediate shipping, we've added a Raw Parts Only option for all versions of the OctaHarp. I've shot a detailed instructional video on how to finish and assemble your PowerParts Kit for it - please watch before you buy! If you're the hands-on type and comfortable working with basic tools, you'll have no trouble following along with the simple steps involved. You'll gain knowledge and satisfaction making it yourself, and save money in the process. Follow the video closely and you'll be sure to get a good outcome. 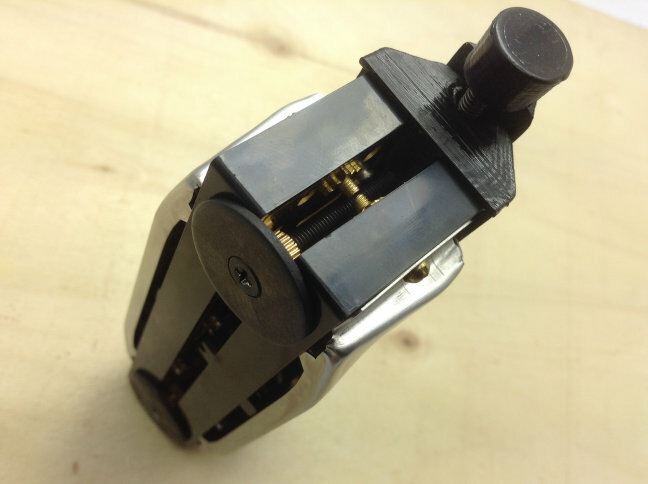 However our responsibility is only with the PowerParts we make and supply, not with your finishing/assembly skills - the end result is up to you! 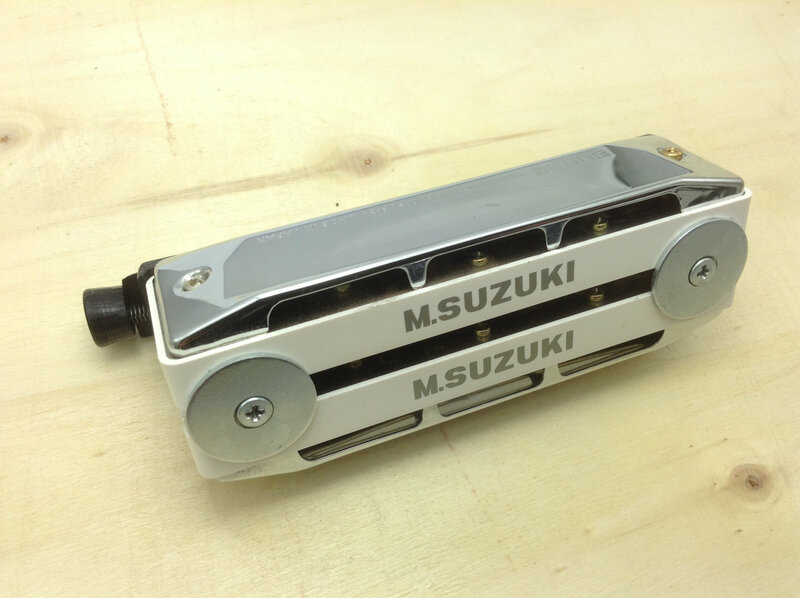 If you wish to pay extra for us to do the finishing of the parts, then go for this option. This will add about a week to the shipping time. Remember that you will still need to supply the harmonicas and fit them to the parts you choose. 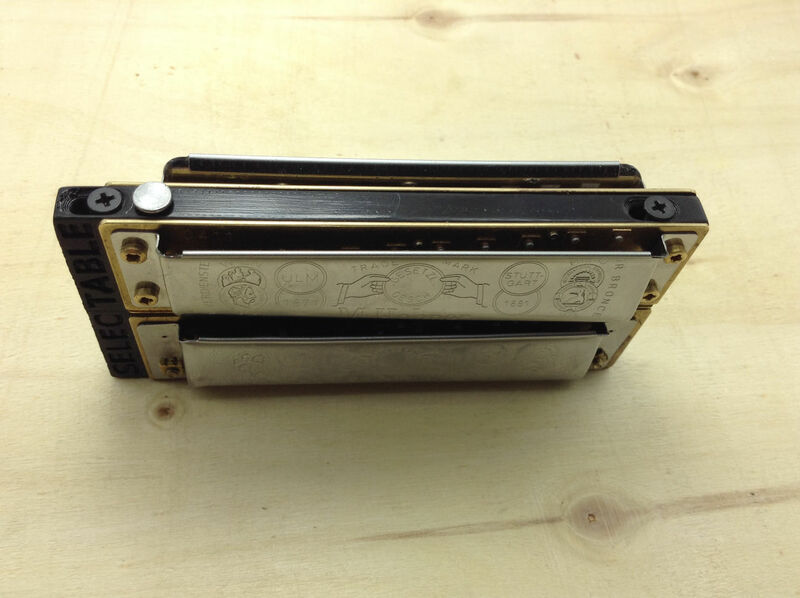 If you would prefer to receive the complete OctaHarp with harps assembled and finished to the highest standard then please see our recommended customiser(s) below. Joel is a Hohner Affiliated Customizer and has the attention of the world's premier harmonica players, inventors, and innovators. He has built a reputation as a quality customizer from his clients around the world. By their testimony, J.A. 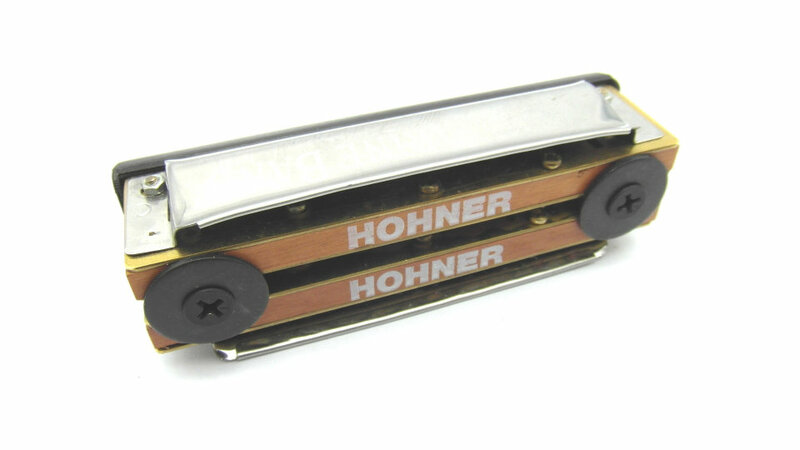 Custom Harmonicas, based on Hohner reed and cover plates, increase a player's authority over the instrument, regardless of playing style or experience. All customization is completed by Joel, and his workshop features both hand and electric tools, including CNC milling machines, CNC lasers, and lathes. 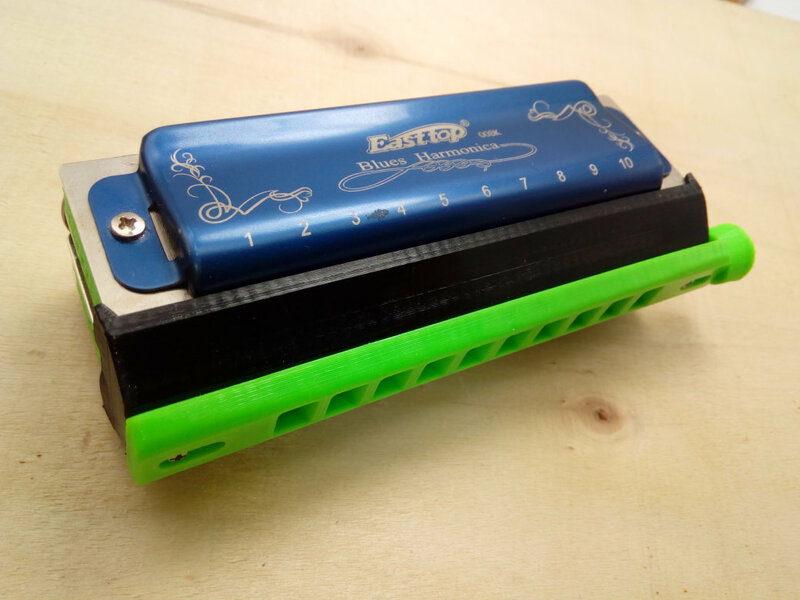 Joel spends most of his time building and developing custom harmonicas and accessories, but he is regarded as one of the finest Irish music harmonicists in the world. In 2014 he came in third place at the biggest Irish music competition in the world, Fleadh Cheoil na hEiréann. Joel is our recommended customiser to make your complete OctaHarp . If you would like to commission Joel then please place your order with him on his website below. Video 0 applies only to the PowerParts buying option. Video 1 is relevant to all buying options. The OctaHarp Selectable differs from my other small 10-hole octave harmonica, the OctaHarp, in two ways: the twin harmonicas are inline front-to-back, and you can choose to play them separately or together! It comprises of two 10 hole diatonic harps in the same key but an octave apart; the front harp is in the standard range, and the rear harp in the low range. 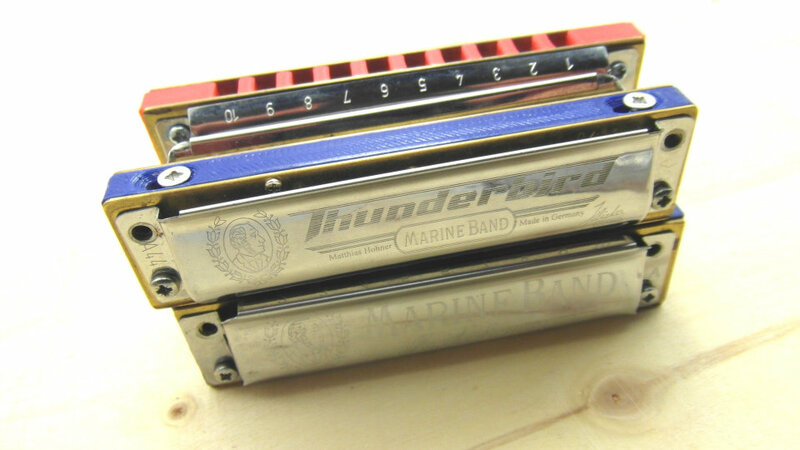 At present the OctaHarp Selectable is designed only for Hohner (Thunderbird/Marine Band 1896/Crossover/Marine Band Deluxe) and Suzuki (Manji/Low Manji) harmonicas. The front harp has holes all the way through the back of its comb, which are blocked in the default position, so just the front harp sounds. 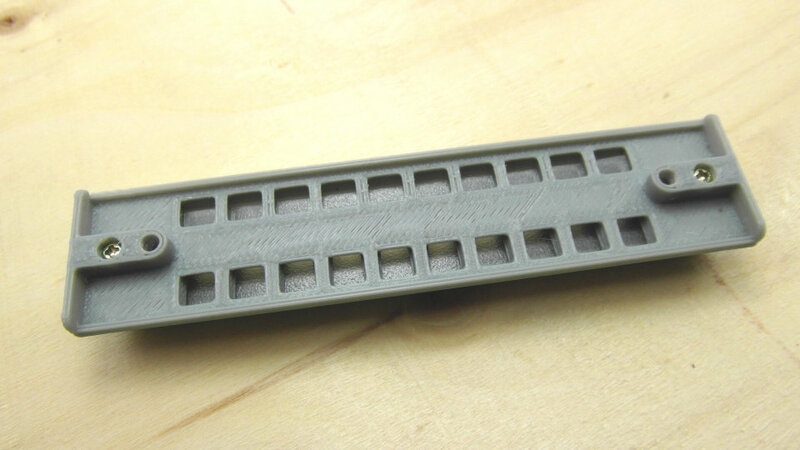 The front comb slides along the face of the rear one, and is held in place by a small spring. 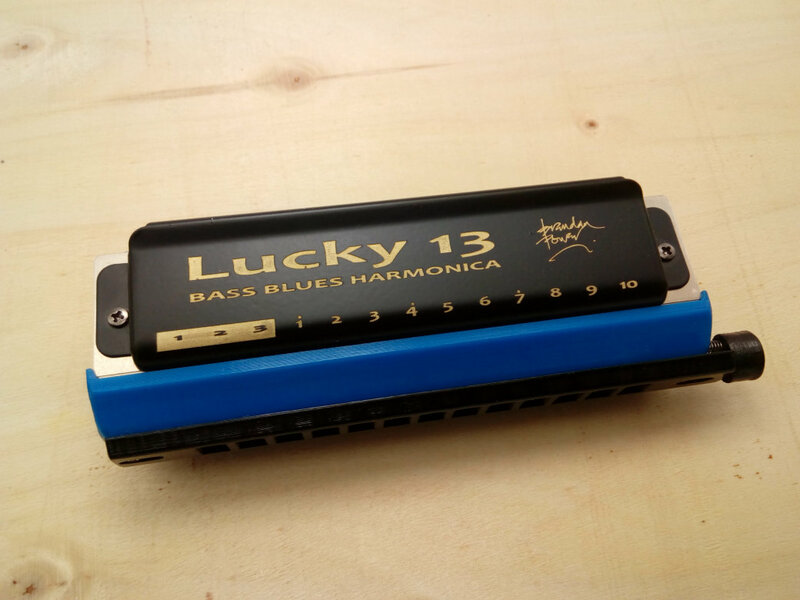 With a quick press of your thumb or finger the two combs come into line, the through-holes open, and all the reeds on both harmonicas vibrate to give you that fat, rich octave sound. In single-harp mode the front harp plays exactly like a normal blues harp, with all the bending and expression you're used to. 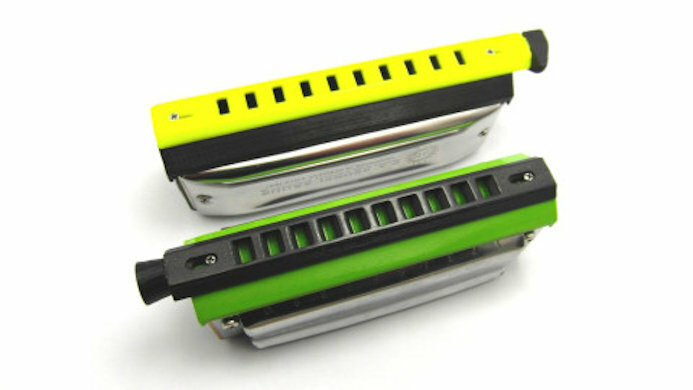 But you can instantly switch to playing it as an octave harmonica - it's truly two great harps in one! Check out the video to hear it in action. While the harps will play OK without valves (especially if reeds are well gapped and embossed), I strongly recommend adding valves to get the best tone, power and response. The front high-range diatonic should be half-valved, to reduce air loss whilst still allowing all your normal bends, and the rear low-range harp should be fully valved - to bring out the true richness of those low-end reeds. 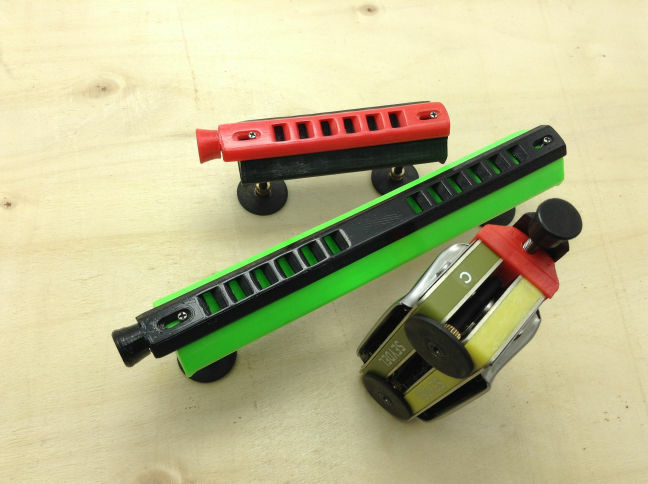 In order to facilitate adding valves to the Hohner and Suzuki harps for this model, I've created my easy-fit Stealth-Valves. 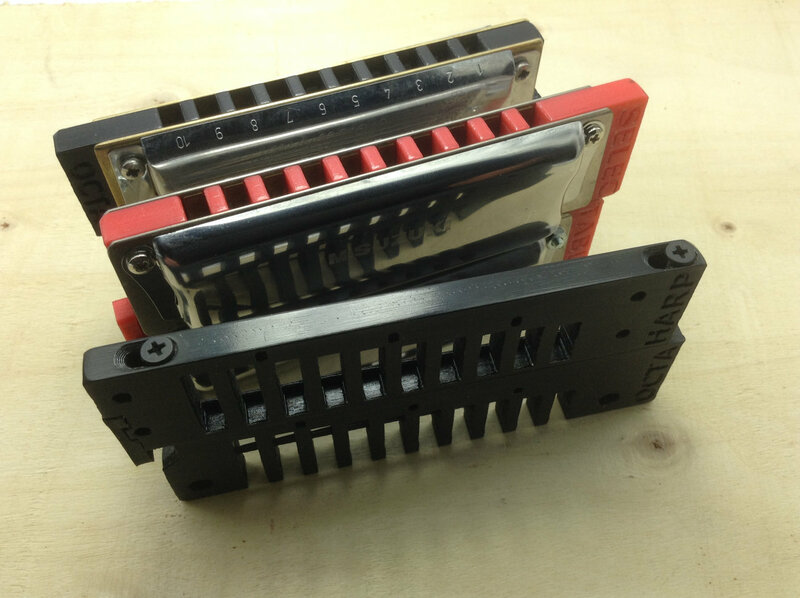 They are available at a discounted price when ordered for the OctaHarp Selectable. Watch the two videos under the order boxes to see how easy it is to fit them. 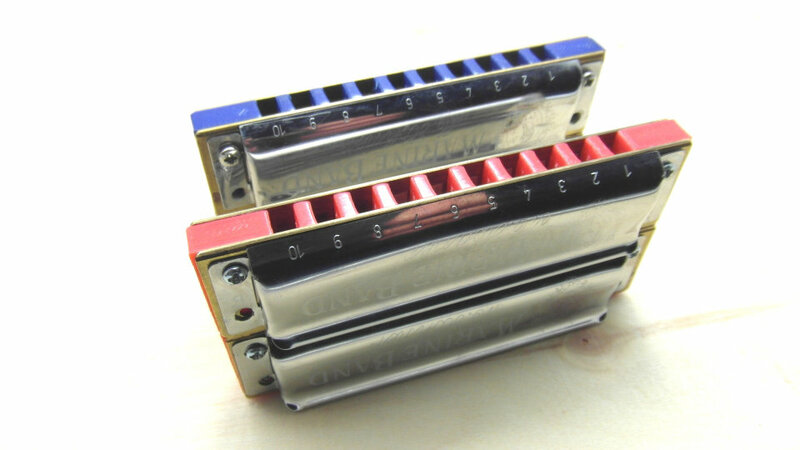 In my experience, when I've put standard and low-range harmonicas from the same manufacturer inline they play well in tune, because at the factory they are tuned to the same tuning scheme. But if you find there is some 'beating' between reeds an octave apart, fine tuning may be required. Watch the video under the order boxes to see how to fine-tune for pure octaves - it's not difficult! To slash the price and offer immediate shipping, we've added a Raw Parts Only option for all versions of the OctaHarp-Selectable. I've shot a detailed instructional video on how to finish and assemble your PowerParts Kit for it - please watch before you buy! If you're the hands-on type and comfortable working with basic tools, you'll have no trouble following along with the simple steps involved. You'll gain knowledge and satisfaction making it yourself, and save money in the process. Follow the video closely and you'll be sure to get a good outcome. However our responsibility is only with the PowerParts we make and supply, not with your finishing/assembly skills - the end result is up to you. Or, if you prefer, send your PowerParts Kit to a harmonica tech/customiser of your choice to do the job for you; in that case the arrangement is entirely between you and them. 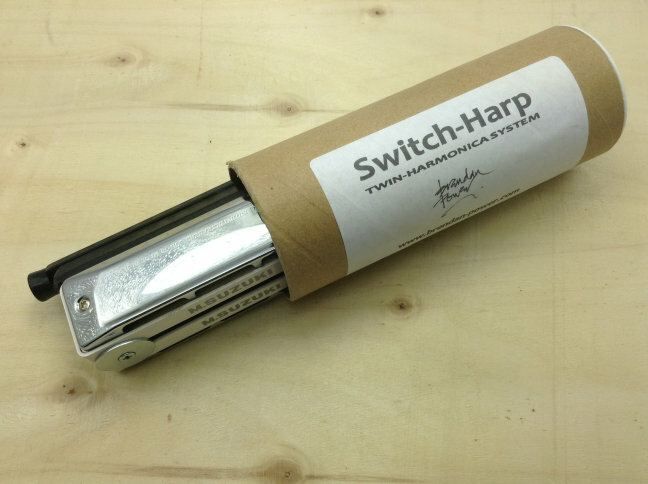 Here is a list of people you can contact to do the work: Harp Techs. 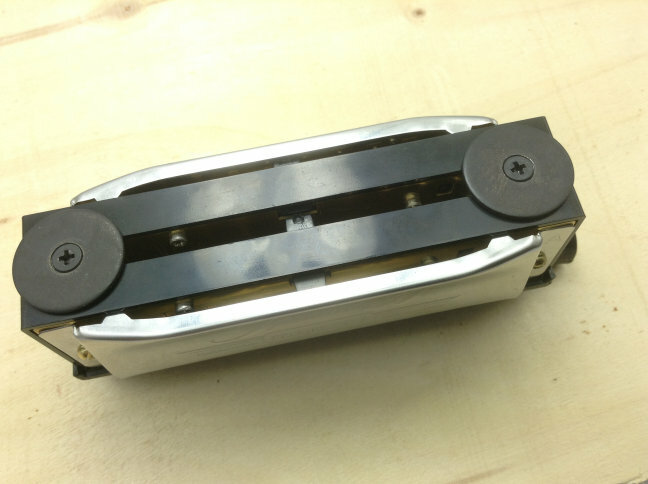 If you wish to pay extra for us to do the finishing/assembly of the parts, the choice is yours. It will add about a week to the shipping time. Remember you will still need to supply the harmonicas and fit them to the parts you choose, or get a customiser to do that job. Video 0 applies only to the PowerParts buying option. Videos 1 and 2 are relevant to all buying options. Because there are double the number of reeds in the airstream at all times, to avoid excessive air loss and get the best sound from my TremoloHarp, full valving is strongly recommended. To simplify this process, I've created my easy-fit Stealth-Valves and valve-friendly PowerCombs. These have special 'valve pockets' at the rear of each chamber, so the valve bases don't get snagged between the comb and reedplates. 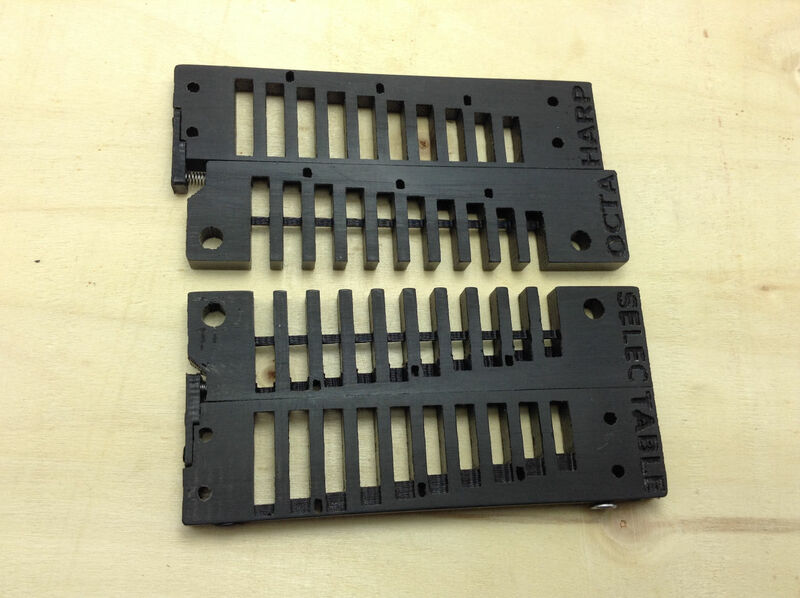 To slash the price and offer immediate shipping, we've added a Raw Parts Only option for all versions of the TremoloHarp. I've shot a detailed instructional video on how to finish and assemble your PowerParts Kit for it - please watch before you buy! 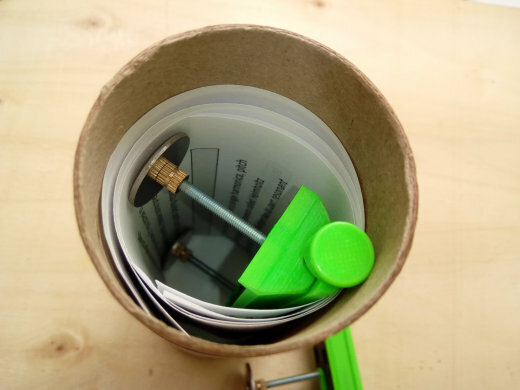 If you're the hands-on type and comfortable working with basic tools, you'll have no trouble following along with the simple steps involved. You'll gain knowledge and satisfaction making it yourself, and save money in the process. Follow the video closely and you'll be sure to get a good outcome. However our responsibility is only with the PowerParts we make and supply, not with your finishing/assembly skills - the end result is up to you. 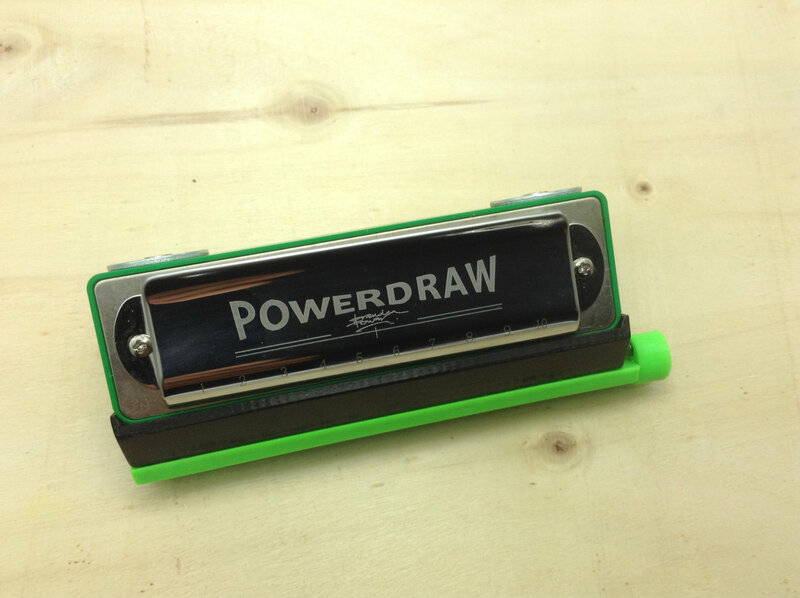 Or, if you prefer, send your PowerParts Kit to a harmonica tech/customiser of your choice to do the job for you; in that case the arrangement is entirely between you and them. Here is a list of people you can contact to do the work: Harp Techs. 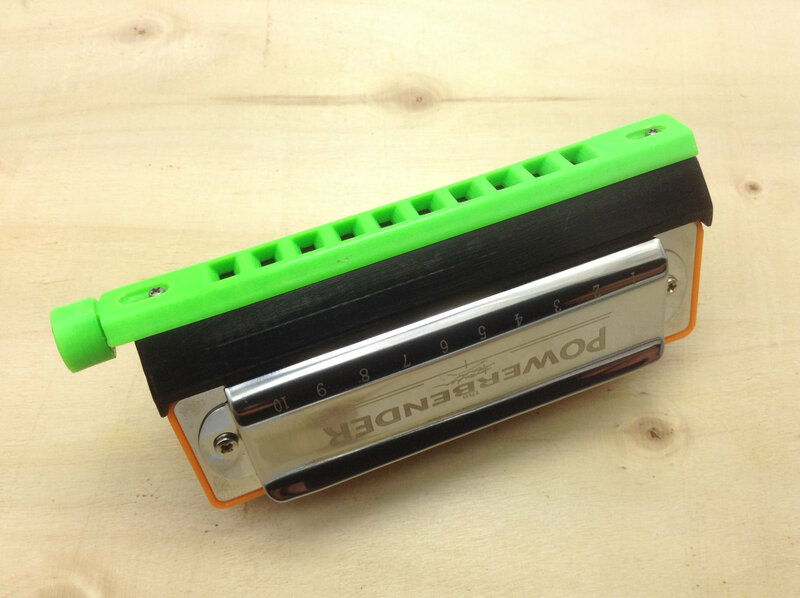 This TwinDiatonic harmonica can be configured in so many ways! 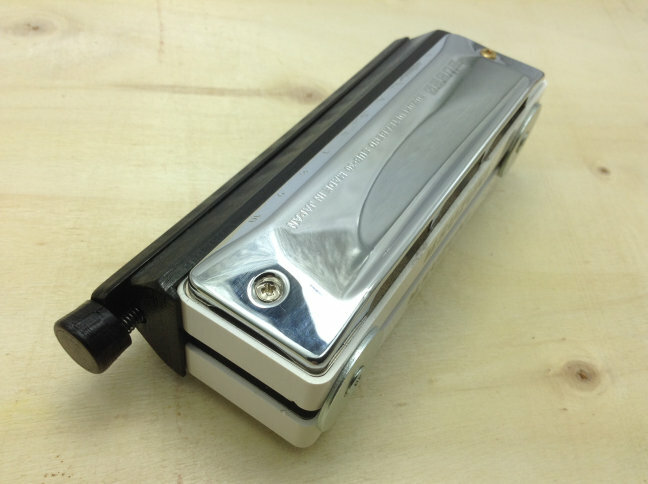 It's called the Switch-Harp because the self-sealing horizontal sliding mouthpiece (patent pending) allows you to switch instantly between two 10-hole diatonics attached behind; the sound you get all depends on what setup, key and tuning you choose for the two harps. 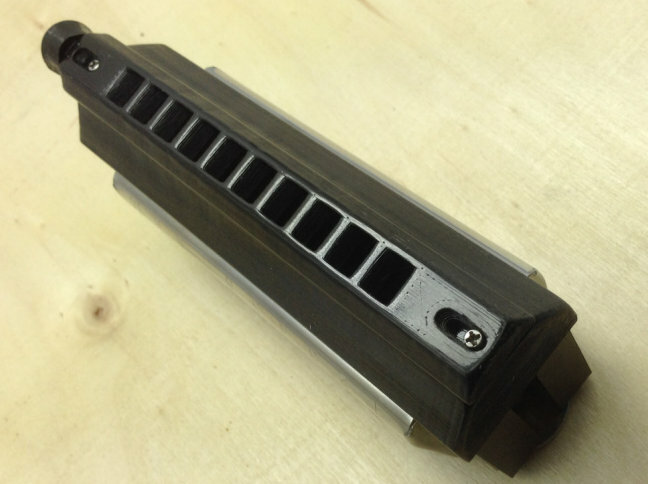 The mouth hole spacing is the same as a normal harp, and you can operate the slider with your thumb in full-cupping position. 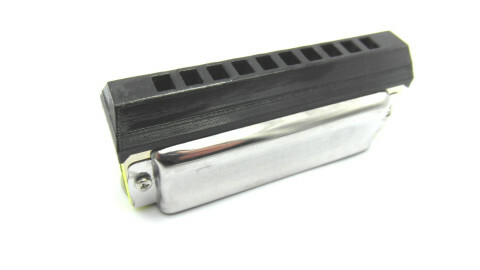 One obvious choice for the SwitchHarp would be for the slider to select between two harmonicas a semitone apart, to make a 10 hole mini-chromatic. This could be in standard Richter tuning, or in any one of many alternate tunings (eg. PowerBender, PowerDraw, Paddy Richter, Solo Tuning, Circular Tuning, whatever you like!). And you can swap in different keys quickly and easily. I prefer it in half-valved setup, allowing your normal bends but making the non-bending notes sound stronger and with valved expression. However if the harps behind are very well customised there is the option to have them un-valved, which would allow overblow playing for those used to that style. 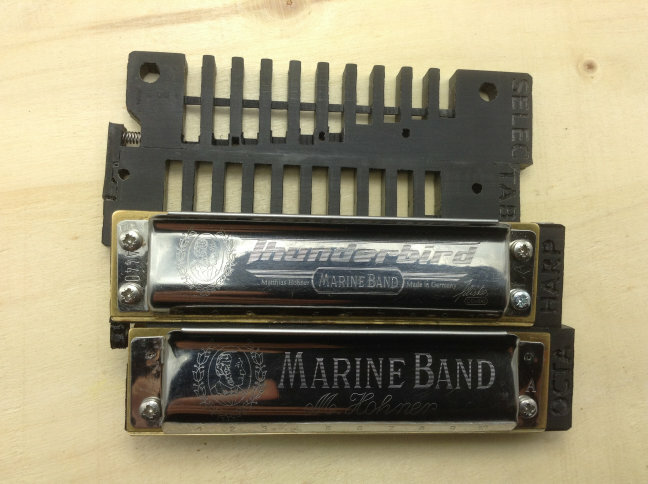 You could install two harps in widely differing keys, to allow an instant harp change mid-song for a key change (as often happens in Country music). Or in a set of Irish tunes you could have G and D harps behind, so it works like my Irish Session Harp. 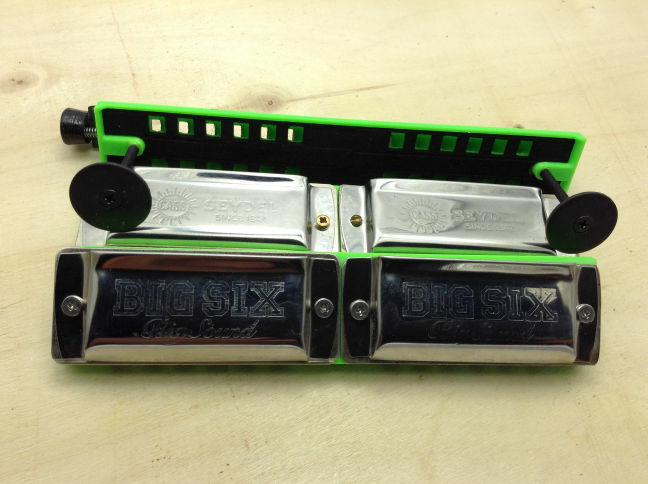 In this setup you could remove the spring and tighten the front screws a little, so the mouthpiece/slider stays put in each position depending on which of the two rear harmonicas you want to play. Two harps in different tunings - eg. 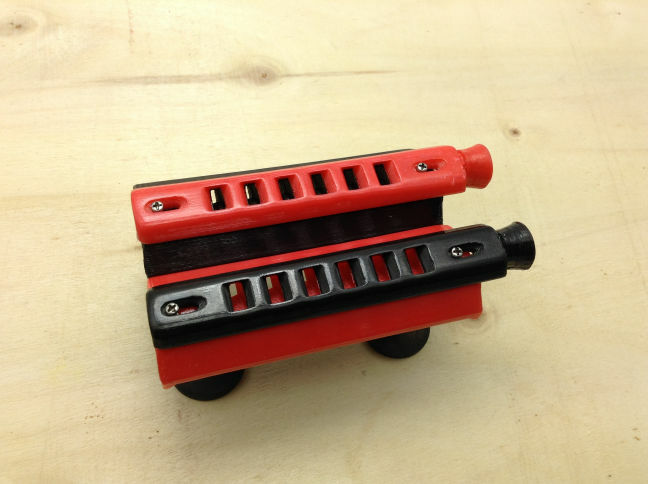 Richter and PowerBender tuning, or Richter/Country - so you get the best of both worlds with a quick push of the slide. Two harps in same key/tuning but different setup - eg. one half-valved, one un-valved. That way you can get overblows and valving expression in the same instrument. Those are just a few of many options. 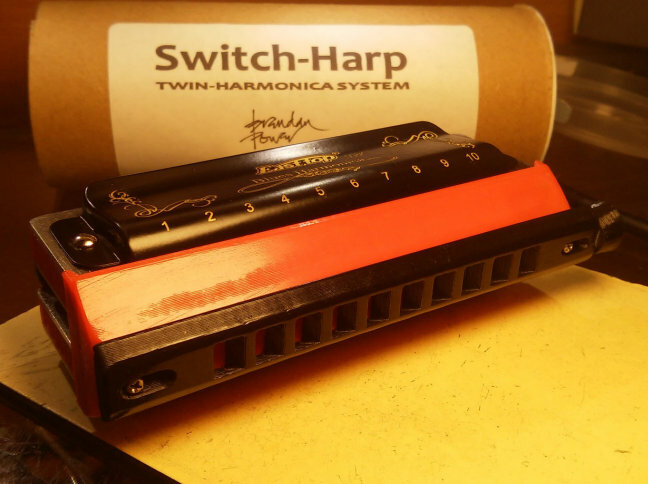 My Switch-Harp is the Chamelion of the harmonica world! 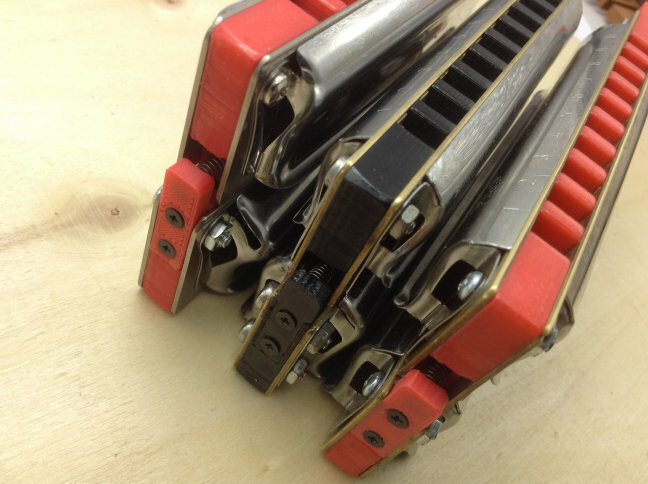 Because the same front unit will allow quick changes of the harps behind, you could use the same one for a multitude of twin-harp configurations if you want. 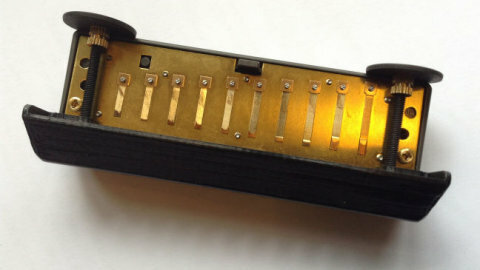 I recommend half-valving for most Switch-Harp options. To simplify this process, I've created my easy-fit Stealth-Valves and valve-friendly PowerCombs. 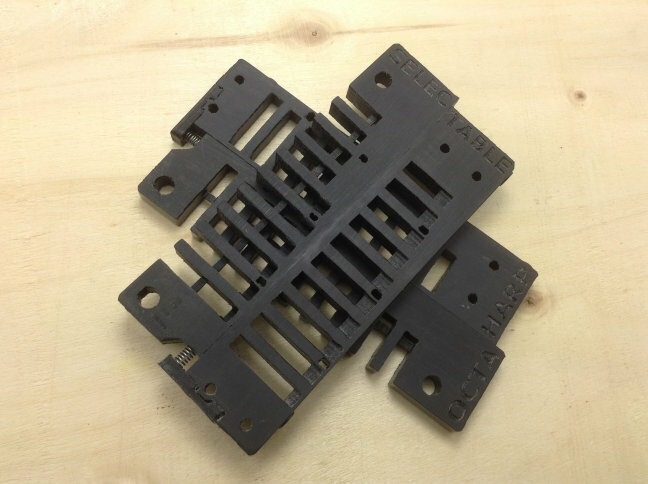 These have special 'valve pockets' at the rear of each chamber, so the valve bases don't get snagged between the comb and reedplates. While you can just buy the front unit to assemble your own Switch-Harp using stock combs, trying to fit single valves to combs not designed for them can be tricky and frustrating. 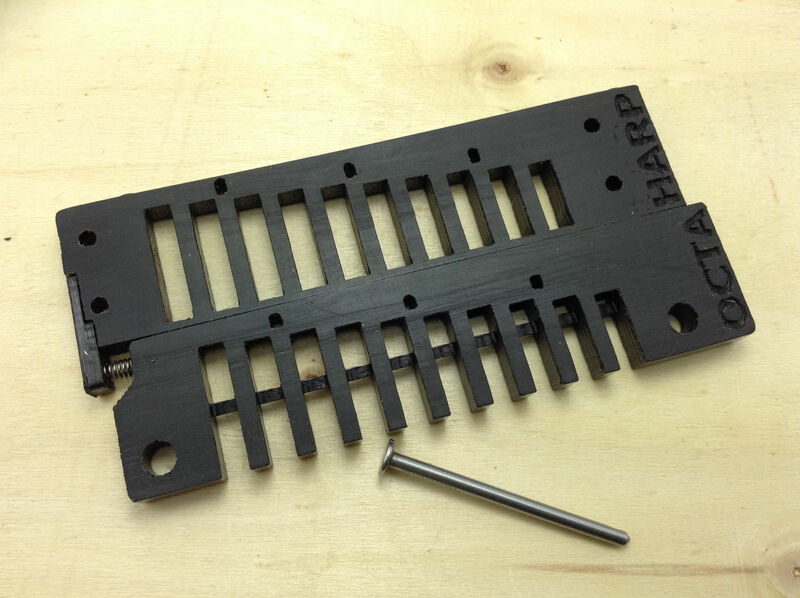 Adding my specially-designed PowerCombs and Stealth-Valves to your order will simplify and speed up the process of making a Switch-Harp that sounds great straight away. 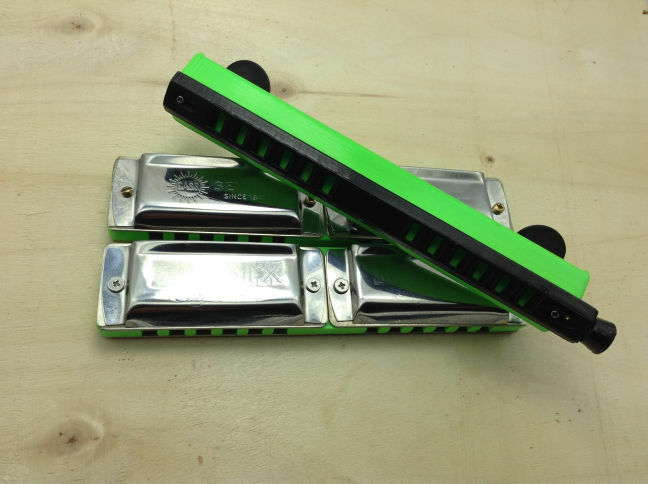 They are available at half-price when ordered for all the TwinDiatonic harps. Watch the video here (Part 2 Video) to see how to half-valve reedplates - it's easy! One thing to bear in mind is that the best range of keys is from C down. Higher keys suffer from detuning of the high reeds due to the Helmholtz Resonance Coupling phenomenon. Even on lower keys you may have to do a bit of fine tuning on the high notes to bring them up to tune with the rest of the harp. This is not difficult for players used to fine tuning. 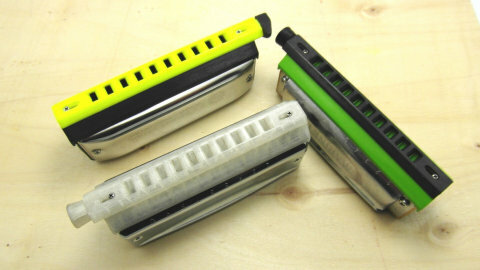 Check the three tech videos opposite; the first shows how to finish and assemble the raw parts (if you are going for the PowerParts option), the second video is for general assembly with your harmonicas, and optimisation of the Switch-Harp, and the third video deals specifically with tuning compensation in the high octave. 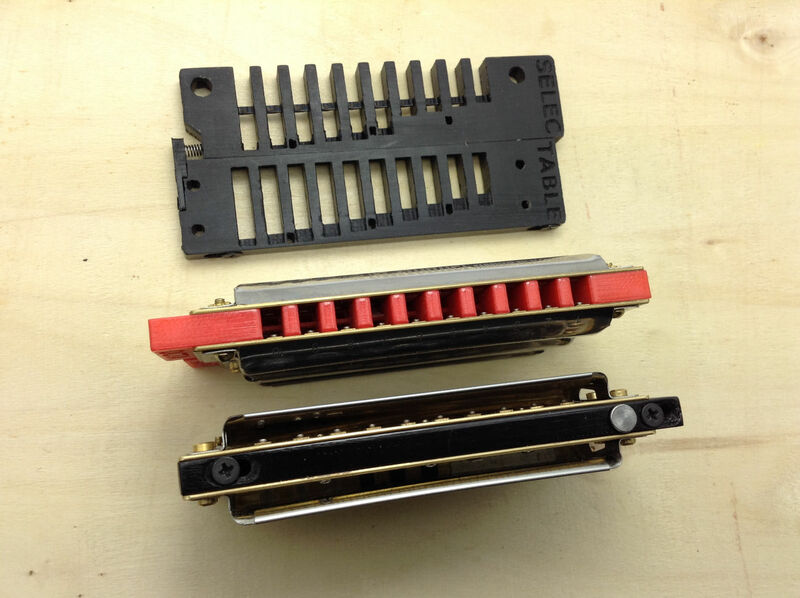 To slash the price and offer immediate shipping, we've added a Raw Parts Only option for all versions of the Switch-Harp. I've shot a detailed instructional video on how to finish and assemble your PowerParts Kit for it - please watch before you buy! If you're the hands-on type and comfortable working with basic tools, you'll have no trouble following along with the simple steps involved. You'll gain knowledge and satisfaction making it yourself, and save money in the process. Follow the video closely and you'll be sure to get a good outcome. However our responsibility is only with the PowerParts we make and supply, not with your finishing/assembly skills - the end result is up to you. 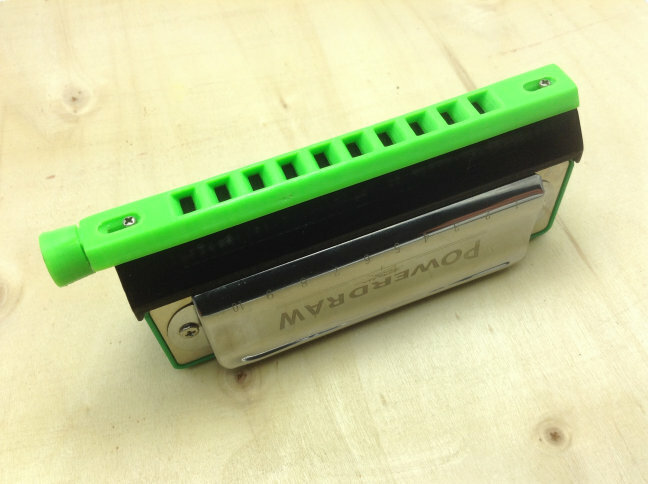 Or, if you prefer, send your PowerParts Kit to a harmonica tech/customiser of your choice to do the job for you; in that case the arrangement is entirely between you and them. Here is a list of people you can contact to do the work: Harp Techs. 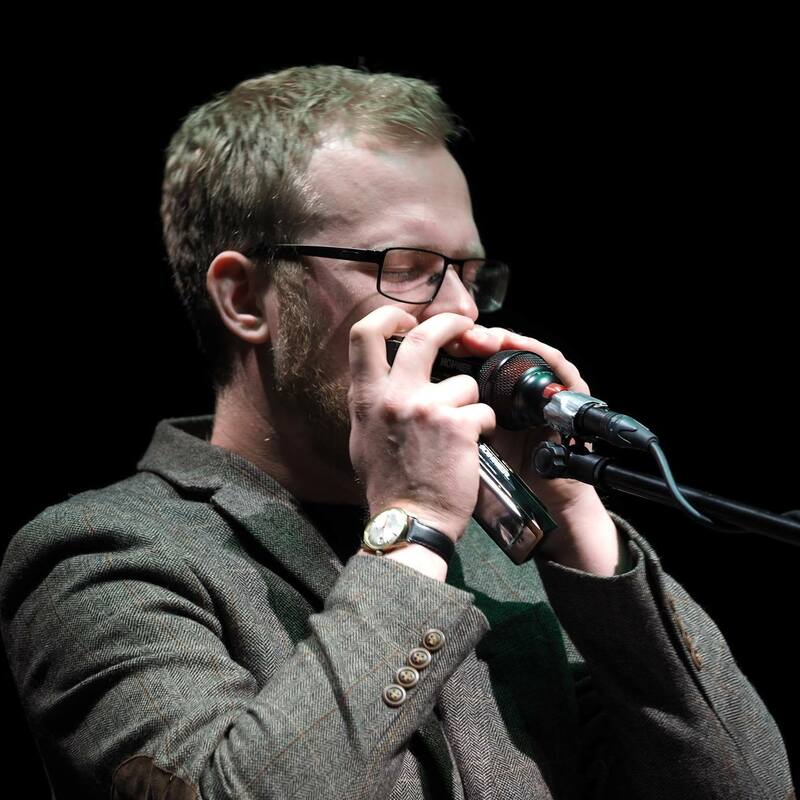 Check out Kevin McCarthy playing his OctaHarp in a session.
" Excited to have my Melody Maker Switch Harp in hand for the first time! The sound is excellent. The mechanism will take some getting used to. Specifically, the slider movement is not like a chromatic because instead of having the slider move while everything else stays static, on the Switch Harp the entire mouthpiece moves within your mouth. Or alternatively, the slider stays fixed on your lips and the mass of the two harmonicas behind moves. After a few more minutes of play - a few more impressions. 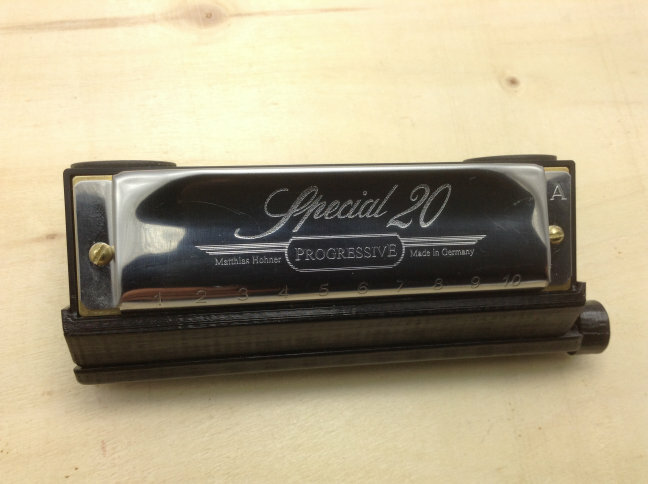 I'm comparing my Melody Maker Switch Harp to a Melody Maker X-Reed Sub-30, another fine harp! And the more I play the more I like it! Truly a novel and unique harmonica with an excellent tone.
" 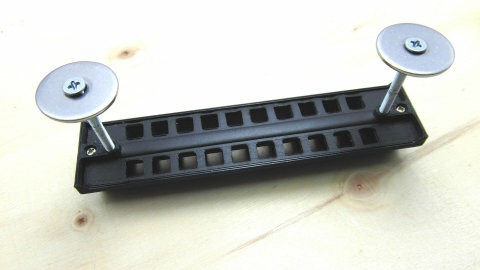 I really like my switch harp. Mine is a basically a pair of half- Valved Paddy Richter's. I haven't had as much time to play or experiment with it as I would have liked but it is a blast so far. 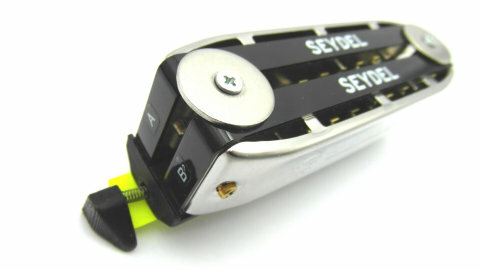 The moving mouthpiece feels odd and unwieldy for about 20 minutes, and then it is no problem at all and feels natural. 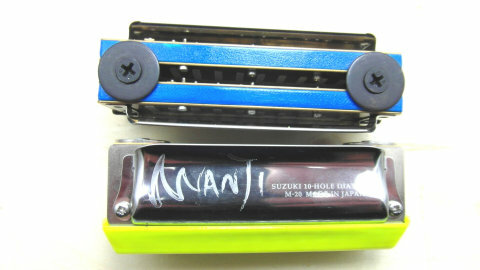 I can play fully chromatically with the button and bends, and can color every note with blow or draw bends or the slide. It's a blast. 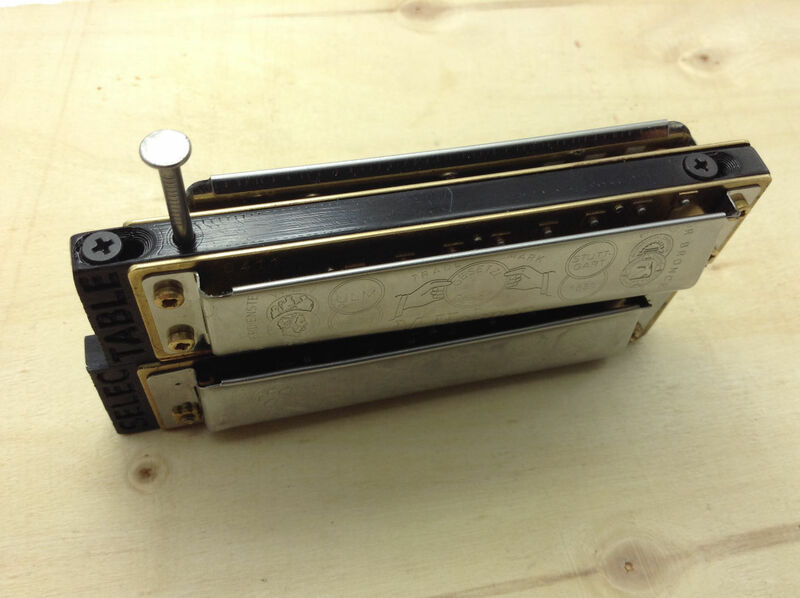 I will probably be retuning some more reedplates so I can make other combinations. It's awesome. 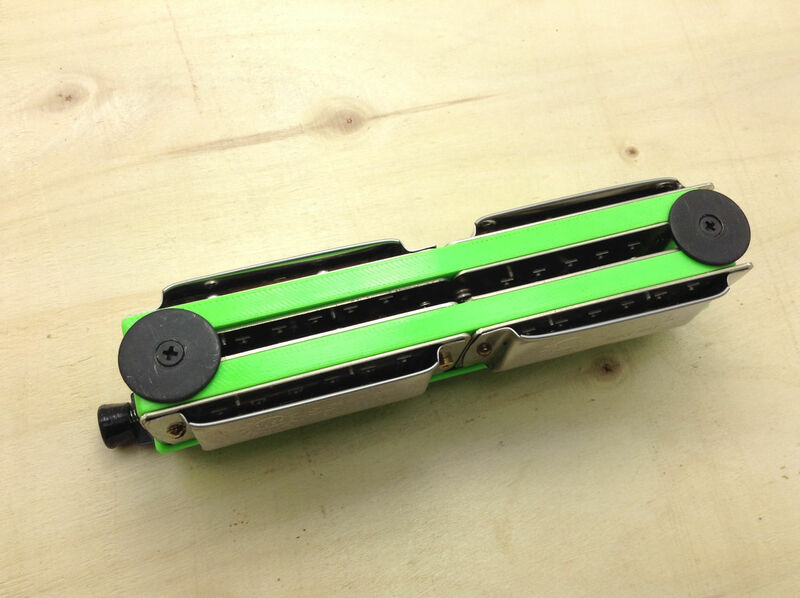 You could build a case to hold a set of comb/ cover combinations and be ready to switch out in moments. "